Chickpeas have it hard in this world. When you can eat chocolate covered bacon or a large burger with a fried egg on top, why would you ever want to consume a chickpea? For a long time this was my take on the very popular legume. Chickpeas are a staple in the middle eastern diet. With their heartiness they even make up great substitutes for protein in a college student favorite, falafel. My early exposure chickpeas wasn't at home, but when I spent summers at dance camp. Yes, dance camp. At one point in time I went to a camp where we would take three classes a day + then consume copious plates of spaghetti covered in Parmesan. Often we would puruse the salad bar, where I came across the salad bar chickpea. Cold, wet + straight from a can, I ate them because I thought they were healthy not because I want to. In college I avoided the same salad bar chickpeas, knowing they weren't worth it. Chickpeas stayed out of my diet until I started to read recipes like they were short stories. People were treating vegetables in ways I never had before. Cauliflower was being cut into steaks, Brussels sprouts were being shredded + chickpeas were getting roasted in the oven. This is a recipe for roasted chickpeas, yes, but it's really just a template to add your favorite flavors to what could have been just another can of boring, cold chickpeas. My favorite way to enjoy these guys (except perhaps just on their own) is on a crusty piece of bread (toasted!) with a nice schmear of goat cheese. Total indulgence. And I thought I would never say that about a chickpea! Drizzle olive oil liberally on a paper lined baking sheet. Add the chickpeas + toss to coat them in olive oil. Add all of the spices. Feel free to add as much or as little of each according to how much heat you're craving. Finish with a liberal sprinkle of salt + fresh pepper. Toss to combine. 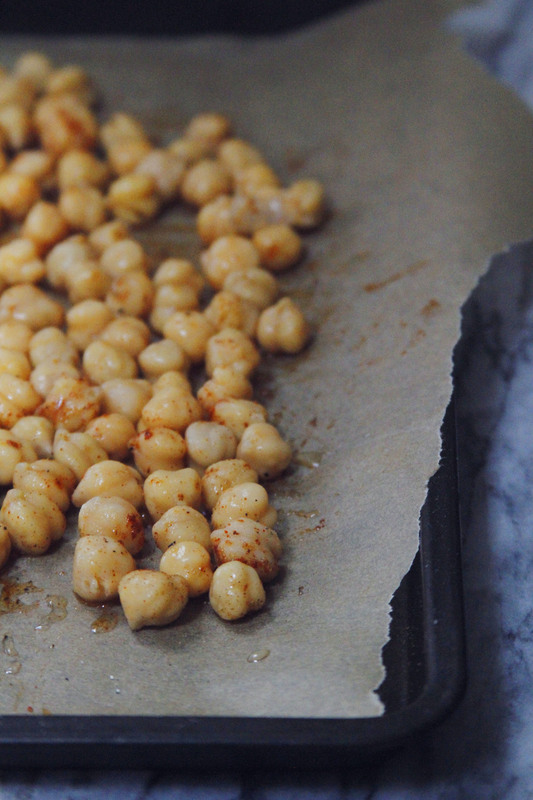 Bake the chickpeas in the oven for 30 minutes until golden + crispy.